Gray leaf spot is a disease of increasing importance in the turfgrass industry in the United States. It has been a chronic disease in St. Augustinegrass (Stenotaphrum secundatum) for many years. Recently, gray leaf spot has caused serious problems in common cool season grasses, especially annual ryegrass (Lolium multiflorum), and perennial ryegrass (Lolium perenne; Figure 1). Tall fescue (Festuca arundinacea) has been damaged by this disease in the southeastern United States. The same fungus causes blast on rice. Rice blast is one of the most devastating diseases in rice-growing regions worldwide. Figure 1. Gray leaf spot on a closely mowed perennial ryegrass fairway. The sexual stage producing ascospores was found in the fungus infecting rice, and so the rice blast fungus is generally called Magnaporthe grisea. In turfgrasses, ascospores have not been observed, and the gray leaf spot fungus is referred to as Pyricularia grisea. Host range of the fungus is more than 50 grass species, including wheat, crabgrass, and foxtail. However, individual isolates of the fungus are limited to infecting one or a few host species. For example, P. grisea isolated from perennial ryegrass cross-infects tall fescue, but it is less likely to infect rice. In contrast, the fungus isolated from rice rarely infects turfgrass. Molecular analyses indicate that the fungus infecting turfgrass is related to the fungus infecting rice. Figure 2. Gray leaf spot on perennial ryegrass softball field. P. grisea is distributed over a wide geographic region. Although regarded as a major disease on St. Augustinegrass, recent epidemics on perennial ryegrass in the mid-Atlantic states and the Midwest have expanded the scope of this deadly disease. It was not until 1996 that the disease was confirmed in Ohio (Figure 2). The disease has become one of the important emerging turfgrass diseases. The pathogen kills the plant from severe leaf blight. Part of the blighting process involves the production of phytotoxic chemicals that disrupt the normal biochemical and physiological balance within the turfgrass. 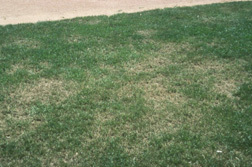 On St. Augustinegrass, the symptom of gray spot shows distinctive spots (Figure 3). Tiny lesions enlarge rapidly into spots that are first round, then round to oval, and later elongate across the entire leaf blade. The leaf spots are tan to gray, often depressed at the center, with irregular purple to brown margins. On cool season grasses, gray spot may not be noticeable. Initial symptoms often appear as tiny pinprick lesions, which often go unnoticed or are mistaken as another less aggressive disease. Under optimal environmental conditions and on susceptible hosts, these small spots quickly turn into watersoaked lesions, which rapidly coalesce together and progress to twisted necrotic leaf tips (Figure 4). If left unchecked, the disease moves rapidly to other susceptible plants. The overall appearance often resembles severe drought stress, but if soil moisture is checked, the test will show that the soil has adequate water. Severe outbreaks look as if the turfgrass was scorched with a flamethrower. The onset of gray leaf spot has been described as a general chlorosis of the sward followed by a rapid blighting of the entire plant. This is an unforgiving disease. In later stages of disease development, the sward may take on a gray color as a result of the mass production of conidia by the pathogen. 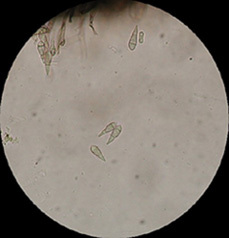 Waterdrop-shaped conidia can be found on leaves infected by gray leaf spot (Figure 5). This feature is a key to accurate diagnosis of this disease. Outbreaks of this disease vary from year to year in the Midwest. The worst cases have occurred in hot summers followed by warm, humid days of late summer and fall, especially after experiencing the remnants of hurricanes. Figure 4. Leaves of perennial ryegrass infected by P. grisea become scorched and twisted. Figure 5. Waterdrop-shaped conidia of P. grisea under the compound microscope. Genetic Host Resistance. Perennial ryegrass cultivars vary in their susceptibility to gray leaf spot, although none can be considered completely resistant. The disease does not affect creeping bentgrass, annual bluegrass, and Kentucky bluegrass. Sodding or over-seeding with Kentucky bluegrass is recommended for repairing perennial ryegrass stands killed by gray leaf spot. Cultural Practices. Balanced maintenance practices that reduce stress should be used for gray leaf spot management. Fertility. Adequate nitrogen fertility is recommended, but avoid high nitrogen application rates during summer months. Overfertility causes excessively lush turfgrass that is highly susceptible to gray leaf spot infection. Moisture. Practices that alleviate or reduce drought stress, excessive leaf wetness, and soil compaction should be employed. Soil moisture levels and irrigation should be closely monitored to avoid overwatering. Turfgrass should be scouted on a regular basis, and appropriate and immediate actions should be implemented. This is critical for this disease because a rapid outbreak can occur under ideal environmental conditions and susceptible hosts.